Combine 1/2 cup beer, 1/2 cup barbecue sauce, 1/4 cup Frank’s RedHot Sauce and 2 tbsp. spice blend. Following manufacturer’s instructions, fill injection needle with marinade. Inject chicken in several places at least 1-inch deep. Place chicken into resealable plastic food storage bag. Pour any remaining marinade over chicken. Seal bag; marinate in refrigerator 1 hour or overnight. Meanwhile, prepare Spicy Cajun BBQ Sauce: In saucepan, combine 1/3 cup barbecue sauce, 3 tbsp. beer, 2 tbsp. butter, 1 tbsp. Frank’s RedHot Sauce and 1 tsp. spice blend. Simmer 5 minutes. Refrigerate and warm just before serving. Using can opener, punch several holes in top of beer can. Place thyme into can. 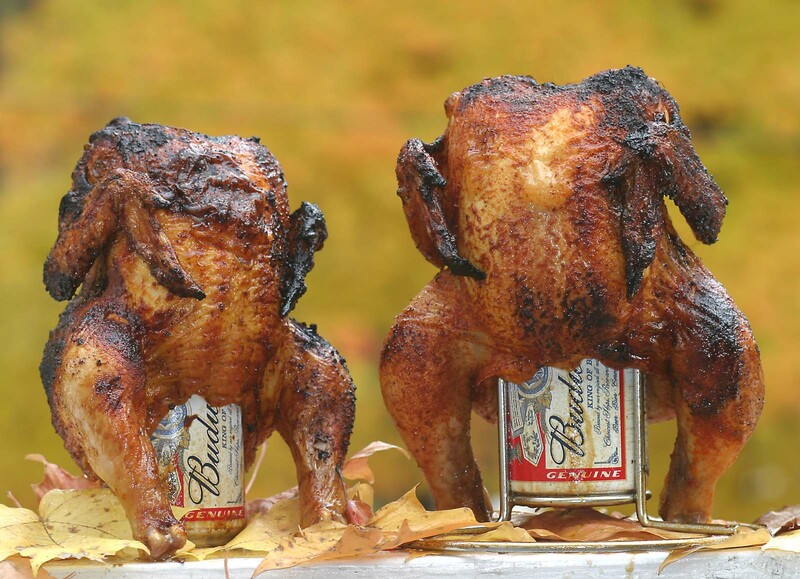 Insert can upright into cavity of chicken, arranging chicken legs forward so chicken stands upright. 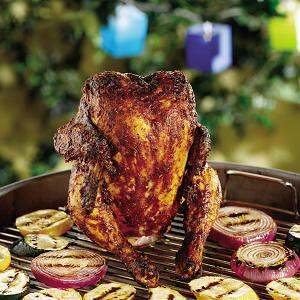 Place chicken upright over indirect heat on barbecue grill. Cook on a covered grill on medium-high (350°F), about 1 1/2 hours until thigh meat registers 180°F internal temperature. (Cover chicken with foil if it becomes too brown while cooking.) Let stand 10 minutes before serving. Using tongs, carefully remove chicken from can. Cut into quarters to serve.